In President Rock Jones’ 10 years at Ohio Wesleyan, he has presided over moments solemn and momentous — and he’s also done some very silly stuff. Among student groups, Jones is known for being a good sport, happy to go along with just about anything to entertain students or support their cause. In 2011, he participated in the Kappa Alpha Theta fundraiser for cancer, Relay for Life, in which students could pay $1 for a strip of duct tape to affix him to a wall (alas, no records were kept on how many strips it took to stick Rock). 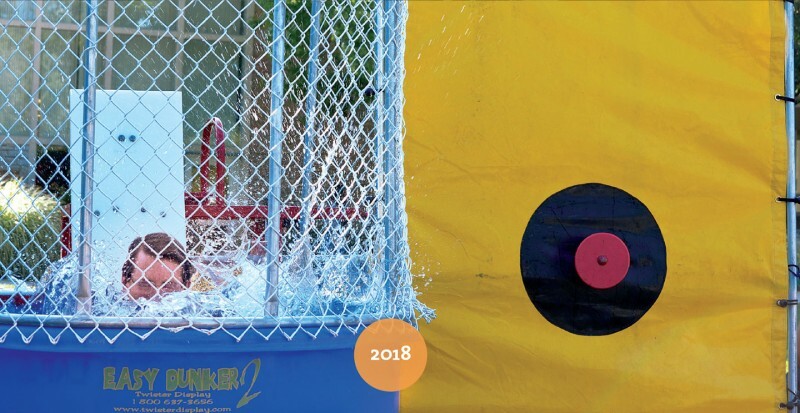 To kick off the current school year, he joined the Campus Programming Board’s water games event Aug. 23 on Thomson lawn featuring water balloons and a dunk tank, where students could take their best shot at sinking Rock. At least a few succeeded.